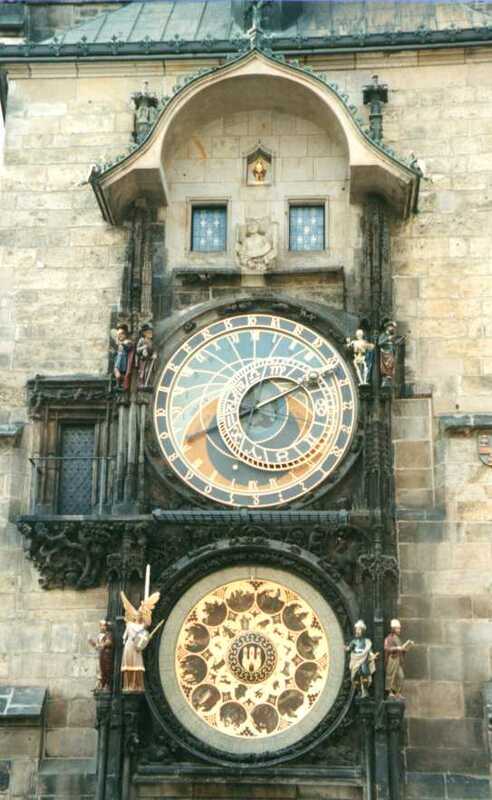 The Orloj (Astronomical Clock) on the wall of the Old Town Hall which chimes on the hour at which time a procession of wooden apostle statues move between the two blue doors at the top of the clock. The orloj dates from the early 1400s. Wooden statues of the apostles in the astronomical clock which appear from one of the blue door at the top of the clock. 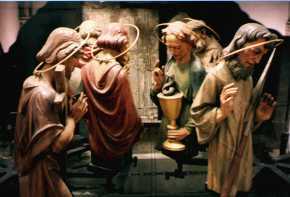 This photo was taken from inside the town hall on the way to the Oriel Chapel. 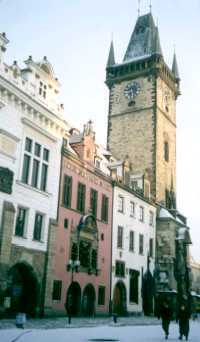 form the Old Town Hall. 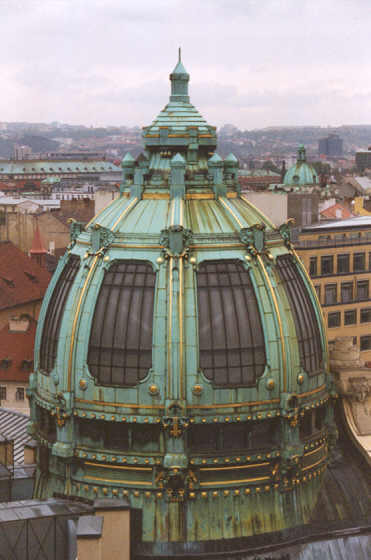 Above is the view, looking towards Mala Strana, from the Powder Tower next to the Municipal House (scroll down to the end of this page). 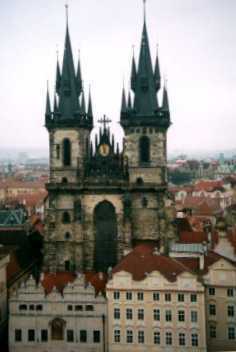 You can see the Prague Castle on the horizon as well as the mini-Eiffel Tower and the Strahov Monastery on Petrin Hill. 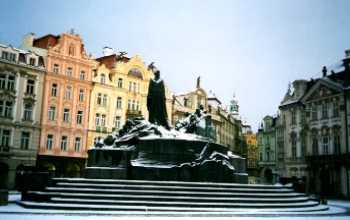 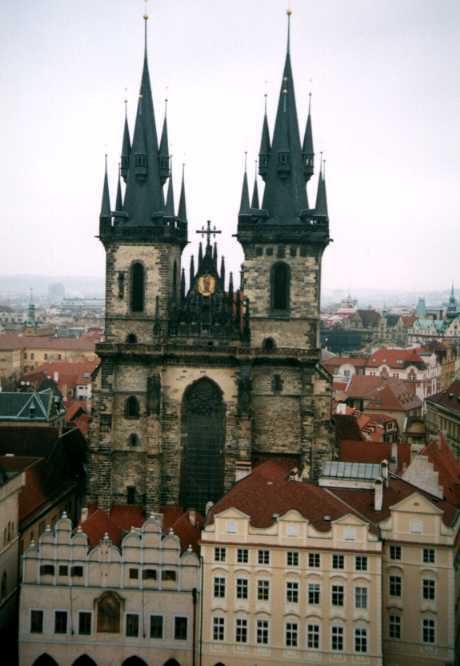 The large church is the Church of the Lady Before Tyn, on Old Town Square. 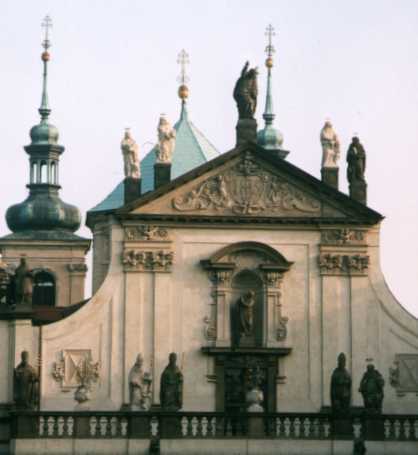 Statues on top of the Church of the Holy Saviour, in the Clementinum, near the Charles Bridge. 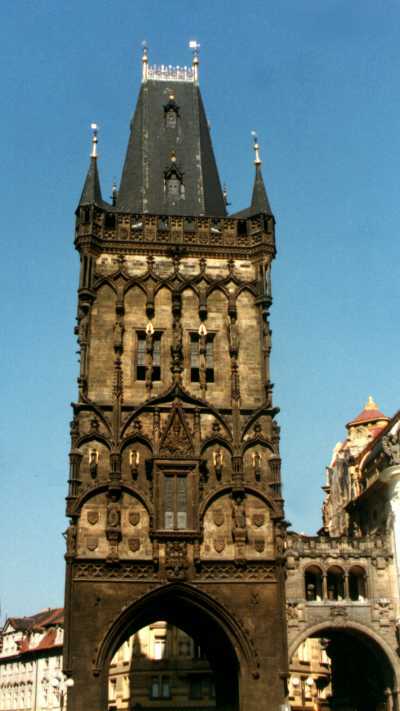 The Powder Tower (next to Obecni Dum) which was modelled on the Charles Bridge tower. 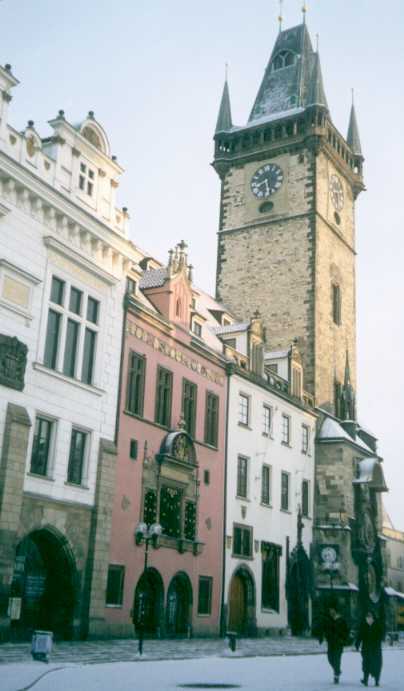 Facade of the Storch House on Old Town Square. This painting of St.Wenceslas was painted in the 1800s. 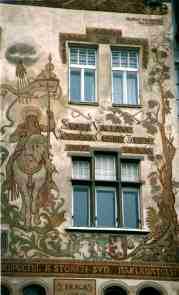 You can see the Bohmeian coat of arms (the white lion) below the windows. 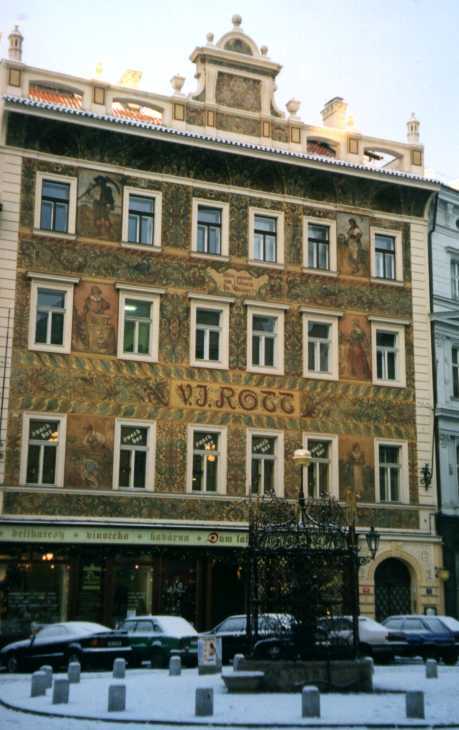 The house of the family Rott (see the larger image to see the name painted on the facade) on Male Namesti (Small Square). 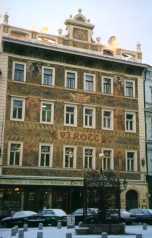 There is a legend associated with this house that tells of the three Rott sisters who, one after the other, were all courted and fell in love with the same man (without the other sisters' knowledge). 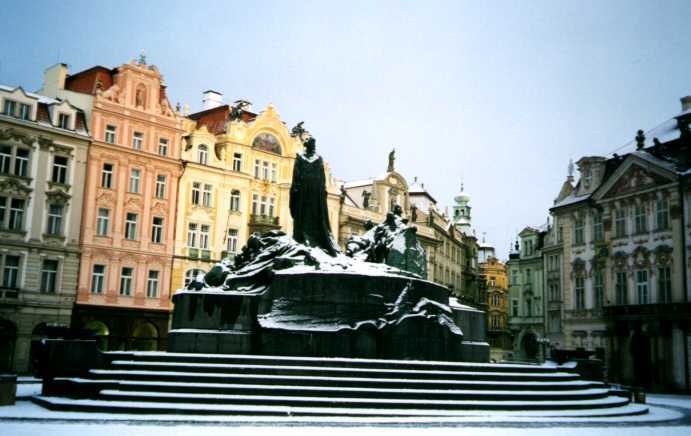 This man murdered all three of the sisters and ended up with all of the family's money. The Rudolfinum (below) which is the home of the Czech Philharmonic Orchestra sits on the bank of the Vltava. 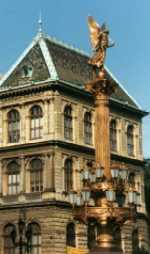 Left is a close up of one of the statues in front of the building. 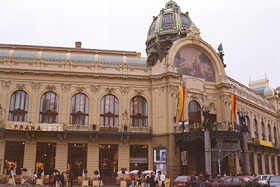 Below is a photo of the Obecni Dum (Municipal House). This spectacular Art Nouveau building was also built in the early 20th Century. 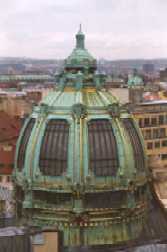 Look out for the paintings by Alfons Mucha displayed in the Mayor's Salon. 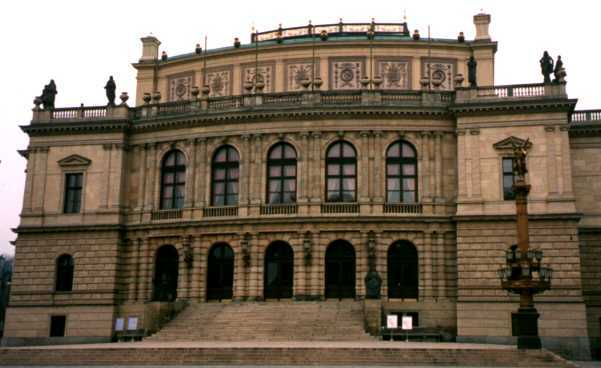 There is a great internet cafe on the ground floor!